I know most of your LOVE Korean foods -- and I admit I'm also one of the many who started the interested in Korean foods from watching Korean TV Series, movies and drama. I mean aside from my curiosity of its taste, I also got more interested on experiencing the Korean table-setting / culture (whatever they call it), how they prepare their foods, the interesting spices and ingredients, down to the serving and table settings, and ahh those unexplainable number of appetizers! I love it and it’s kinda hard to explain, you'll only understand it when you experience it first-hand. Although this is not the first-time I've visited Korean restaurants (you may also visit the cheapest Korean restaurant in The Fort, Bonifacio Global City) I always have this feeling of excitement to learn and experience something new! Last October 2015 (this post is originally published last December 2015) because of a much unexpected reason (okay not so unexpected coz in reality, I did a side-trip after my boss asked me to deliver paper-works for our client, shhhh). I was in Malate area for around 10 o'clock in the morning, already feeling hungry and I instantly look for the first restaurant that is open at 10:00AM. Actually I wasn't expecting that there's an open restaurant at 10'oclock but right next to the Palm Plaza Hotel, is a Korean restaurant called Cafe Chosun. I was so hungry (nope starving is the right word) and also my foodie excitement, and decided to have my brunch. Gosh, I find it soo cheap! I've noticed that I'm their customer that time (maybe I'm the early bird) so while waiting, I got some snapshots using my iPhone. The interior is quite cozy and relaxing, simple, yet you could feel the Korean ambiance. You could also see some TV-screen playing the newest K-pop music videos! After about 5 minutes, they served me these enticing appetizers! Appetizers are combination of Korean noodles, small boiled eggs, kimchi, sliced sausage, and honey-sweetened boiled peanuts. Just for these appetizers I'm already sold! Gosh, I will tell you that you must avoid eating too fast in this Cafe, because you will miss its goodness. I kept myself calm and readied my hungry tummy for this delight. Considering this are appetizers alone! Cafe Chosun is located at the corner of Pedro Gil and Adriatico in Malate, next to Palm Plaza Hotel. PS. 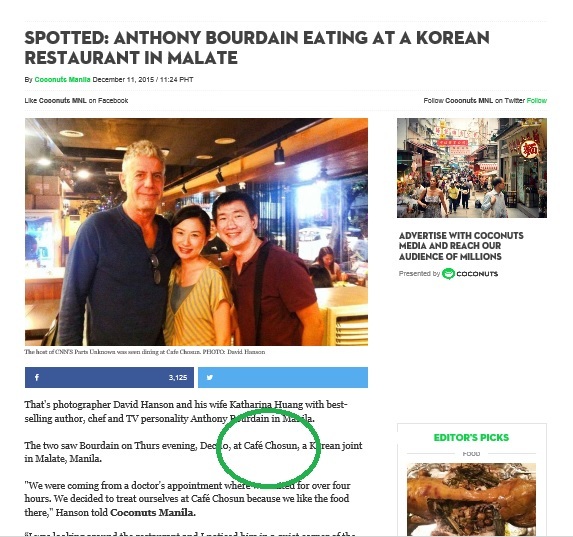 while writing this review, last December 10 Anthony Bourdain of CNN's Parts Unknown was spotted dining at Cafe Chosun. Check the full article here courtesy of Coconuts Manila. Wow your post is making me hungry. The food looks (and sounds) so good. If Anthony Bourdain went there, you know it has to be a special place. Awesome post. Thanks. I don't think I've ever been to a Korean restaurant. So it wa fun to read about it! The appetizers look great. And it's so much! It is very cheap. And the meal you got looks very tassy. Good thing you went there! I can't believe it too when I first dine in there. Because I've already expected that Korean foods are also expensive because of the commercialization and hype. I was so happy to know they are cheap! The owner said, he didn't pay for any promotions or advertising coz customers are always coming, specially the neighborhood. This has delicious Korean food and it's open late into the night? I'd need some of those closer to where I live ! What I also like Korean foods is that they always have rich in side dishes mostly combination of vegetables and fruits, and delicious spices. It seems strange to me that there are no other customers, did they open especially for you? Maybe just a quite time of day? Hahaha i like the way to present your post through images :) Interesting. Cafe Chosun looks really cozy and has such a home atmosphere and we know those are the best cafes. Also, would is just to die for! The best part of dining here is, you can hangout as long as you want! The food is appetizing and nice.. Lovely delicious! Yeah, but if there is a Korean restaurant near your place, I suggest you try their cuisine :) It's like travelling back to their origin - Korea! I've never had Korean food before, I eat like a toddler, and I'm trying to broaden my horizons by branching out to try new foods. Everything you had looked interesting, I wonder if I would like it? I used to raised my brows with Korean foods, but then I challenged myself to try, and now I love it. I started on eating their side dishes, mostly they are veggies and fruits, then elevate to their kimchi and other spicy foods. This looks like a great place! And that food looks absolutely amazing. Food looks delicious but I don't think I've ever tried Korean food. Something to add to my "new foods" list for sure. Yum! This is making me super hungry. I mean look at that delicious food! Yumm! I absolutely love Korean food :) Thanks for sharing. I love Korean food! I used to have it for lunch at a local restaurant near my workplace. It is so yummy. This restaurant looks amazing! Thank you dear! And surprisingly their foods are cheap! Sometimes when I visit them, I think I could stay for whole day and enjoy their foods. The food looks pretty enticing. I miss being around authentic Asian cuisine! This looks like a fantastic place to visit. Food looks delicious too. Yes it is! I'm craving to visit them again one of this coming days. I seriously love asian food! it is one of my favorites. all the food you ordered looks so yummy and it looks like you enjoyed your time. Good food at the cheap price, what's not to love?!!! It's almost lunch time and I'm feeling super hungry after reading this. Yum! What a tease for you to eat such delicious things in front of me! Just kidding :-) I would be happy to try it out if I was in that area. Everything here looks so good - a really delicious selection. I like the vibe and the food looks really good. Yummy. Thank you Valerie, I enjoyed it much. Yumm.. That food looks so good! I have never had Korean food but I'd love to try it when I got a chance! You will enjoy it for sure.. Korean foods are more of veggies and Korean meat, so its more healthy stuffs. Hello Dear, thank you for visiting! Am sure you will like Korean foods! Wow what a feast which all looks so yummy! I cannot believe the price for all that food! Boy do I miss restaurants there in the Philippines! This place looks yum! Well hope you visit soon! I would love to it is just a little to far:) But it looks amazing! hahaha thanks for visiting Andrea! I love Korean food. The restaurant looks beautiful and the food looks fantastic. Thank you! Yeah and we enjoyed a lot. My friends have bigger appetite than me. Basically Korean foods are like any other cuisine, but more of spicy and veggies. I also like their Korean beef barbeque! Korean foods are some of my favorite. You're so funny--I love your personality! Wow! The food looks great and with so much variety. I am hungry and full at the same time from just looking at it. Actually I ordered just one meal.. the rest are just side dishes of this one meal. The more meals you ordered, the more side dishes you'll get. Dang! That is super cheap for all that food! Great review - looks like a fun and tasty place to visit! I really like Korean food, at least the things I've tried! Your post is making me so hungry, everything looks delicious! Thank you Lulle! And am happy to know that you love Korean foods too! The deliciousness is gettin' real up in here! I absolutely love Korean food, so this place looks great! I also love their decor, and the character of your pictures is adorable. Awesome job. Wow your pictures made me hungry! The appetizers look delicious! Great review, I love all the pictures. Thank you for visiting Shelby! hahaha thank you Alessandra :) Keep on browsing my blog for more fun stories and reviews! Wow, definitely good food. I'll have this in mind, when I go to BGC next time!